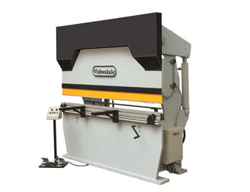 Constantly endeavoring to attain maximum customer satisfaction, we, Vishwakala Machine Tools, are a name to reckon with. Established in the year 1967, we have been following an innovative business approach as well as set industry norms. Today, we are counted among the most renowned manufacturers, exporters, and suppliers of the industry. Our comprehensive array comprises Power Press, Shearing Machine, Press Brake Machine, Plate Bending Machine, Section Bending Machine, etc. These are exported to Africa, US and Far East. Owing to our impeccable quality standards, we have acquired the membership of Machine Tools Manufacturers Association (India) (MTMA). Copyright © 2010 www.vishwakala.com, All Rights Reserved.